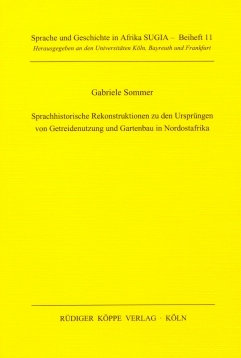 In this present study the author tries to illustrate the progressive diffusion of agricultural knowledge in North-East Africa since Pharaonic times. As source material she pays particular attention to historical linguistic evidence from the semantic field of food production vocabulary available for Afroasiatic, Nilosaharan and, to a lesser extent, for Kordofanian languages. The area of investigation for this study is defined as stretching from Lake Chad in the west to the Egyptian Nile Valley and the territories of present-day Eritrea and Ethiopia in the east. The author bases her investigation on linguistic data gathered from more than sixty languages and takes into account relevant results from other disciplines such as Egyptology, Archaeology and Archaeobotany. Hitherto, archaeological reconstructions of the origins of agriculture have been confined mostly to the Egyptian Nile Valley area. There, a large scale transition towards the regular cultivation of foodplants, including imported varieties (e.g. barley, wheat, flax and some leguminosae), has been discerned during the 5th millenium BC. Evidence for such a development in regions further south, however, is still scarce if not entirely missing. Archaeobotanical evidence meanwhile has suggested that there existed three independent areas of utilisation of autochthonous African food plants (i.e. Ethiopia, the Sudan and the forest margin). The author suggests that these areas at least partly coincide with the regions of origin of two major African language phyla (Afroasiatic, Nilosaharan) in north-east Africa. The most relevant finding of the book concerns comparative lexical isoglosses whithin Afroasiatic and Nilosaharan languages which share phonological identity or close similarity but at the same time exhibit a considerable degree of semantic divergence. This divergence may have been caused by historical changes in subsistence activity, where autochthonous African food plants were substituted by imported plants of a completely different category, yet aquiring the old denomination.